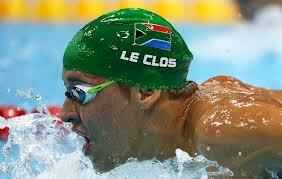 Yesterday, July 31st, South African Chad le Clos defeated the great Michael Phelps (19 times olympic medalist – with 16 gold medals thus far – cited as being the Greatest olympian of all times) in Men’s 200 m Butterfly, and won the Gold medal. Last Sunday, July 29th, South African Cameron van der Burgh won Gold medal in Men’s 100 m Breaststroke. Watch out for Alaaedin Abouelkassem of Egypt who qualified yesterday for the final in Fencing, and will get either a Gold or a Silver medal in Fencing! Alaaedin Abouelkassem won silver last night! And the South African Lightweight Rowing team (Thompson, Brittain, Smith, and Ndlovu) just won Gold. So far, Africans are truly representing. Senegal’s Men soccer team is in the quarter finals (will be playing Great Britain in Quarter finals). Keep watching and supporting our brothers and sisters. Last night, Tirunesh Dibaba won the 10,000 m female final in an outstanding sprint finish. My goodness to have so much energy left after running 9600m is unbelievable. The distance between the ‘baby faced destroyer’, and the 2nd, was well over 60 m. Imagine that! All Hands to Tirunesh Dibaba for winning the olympic gold again. I look forward to seeing her in the 5000m on Friday.